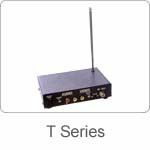 The T-713N and T-512P series are new model UHF / VHF Video Senders. They accept any video (composite video) and audio input then transmit a modulated signal (RF carrier) by antenna. The TOG function can provide test pattern to easy set TV channel without insert AV source. The PAL G/I switchable model can provide 5.5 MHz of audio carry frequency for match TV's system.